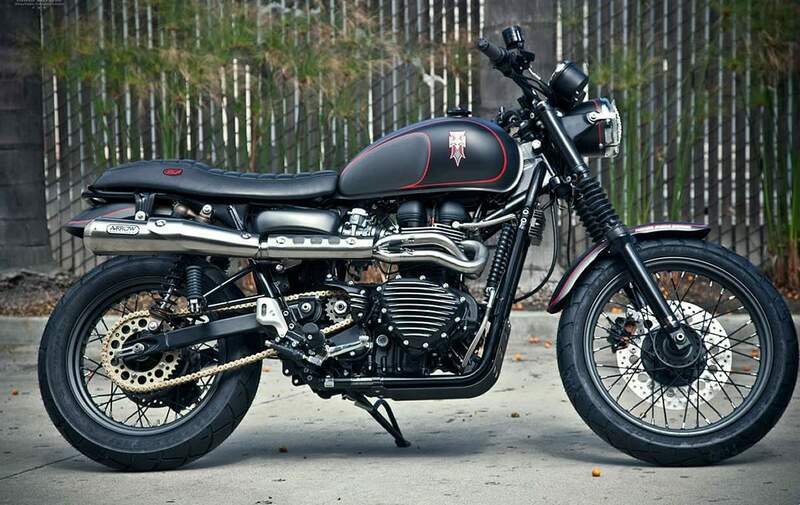 The Triumph Scrambler 900 that RSD built for the Tony Hawk Foundation, It went under the hammer at a charity auction to raise money to build free public skateparks in low-income areas. 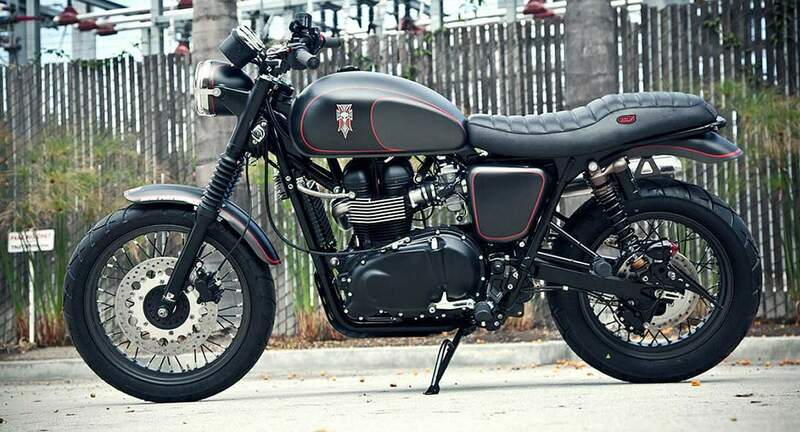 The base of this build is a 2011 Scrambler 900, which was provided by Triumph. According to RSD “We have re-worked this machine to feature a number of upgrades to boost the performance and give the machine a unique aesthetic, worthy of the Hawk brand”. The stock Scrambler handlebars were replaced with over sized Renthal Fatbars, mounted on modified RSD raisers. On the fly adjustable-reach billet Pazzo brake and clutch levers, one-off black ops RSD tracker grips wrapped in Renthal rubber. The rear fender has been trimmed and shaved by RSD and the stock turn signal and brake lights have been replaced with a sleeker unit. RSD have also installed their own side mount license plate and a LED taillight. The front turn signal mount is another RSD hand crafted unit built only for this project. All the bodywork has been painted by RSD’s personal favorite Airtrix with two tone, satin titanium color combination and red pinstripe. The custom paint job also features a Hawk logo on both sides of the tank and both fenders also feature RSD lettering. RSD have used an OEM Triumph Thruxton Seat and recovered it with RSD spec leather with a hand-tooled hawk/triumph logo on the rear and RSD logo badges stitched into each side. The wheels of this Triumph Scrambler were wrapped in Dunlop Trailmax TR91 tires by Dubya USA and to increase the braking power an oversized floating front brake rotor has been installed. The stock Scrambler rear shocks have been replaced with custom built Progressive Suspension 970 series reservoir shock, providing a bit more ground clearance. Progressive Suspension have also re-sprung and re-valved the front forks. The bike also features a cast aluminum ribbed stator cover and front sprocket guard, supplied by The Speed Merchant. One of the many eye catching elements is the gold series D.I.D. o-ring version chain, connecting them together a hard anodized aluminum Renthal rear and British Customs solid steel front sprockets. Triumph Motorcycle America provided Arrow 2 into 1 stainless steel exhaust, an aluminum skid plate and floating rotor. British Customs supplied a K&N air filter kit, battery box, air injection plugs and a reflector re-locator.